​Once you make the journey, there are lots of great things to do in and around Amsterdam and Holland. One of the best ways to stretch your travel dollar and experience the city at the same time is to sign up for a tour. Individuals and groups visiting Amsterdam will find hundreds of different sightseeing tours, bike tours, bus tours, canal boat tours, foreign-language tours, bicycle tours and walking tours that allow travelers to see all of Amsterdam's and Holland's famous landmarks and attractions. The high quality tour excursions are a great way to see the sights while learning all kinds of interesting local facts and historical information too. The prices vary from around $20 for the simplest daily walks and canal rides, to $500 and up for more elaborate multi-day cruises and private guided trips. Starting with the most affordable ways to see the city and moving up to more expensive adventures, here is a sampling of some of the most popular tours offered in that amazing city known as Amsterdam. A day cruise on Amsterdam's picture-book canals that exposes the city’s most beautiful spots in the comfort of a glass covered boat is a great way to experience Amsterdam with a unique perspective. One or two hour canal cruises travel along the principal canals to display wonderful views of the city along with 17th century gabled houses, numerous baroque churches, and enchanting bridges. Typical day cruise prices start around $20 per person. Traveling in a bus with a transparent roof provides panoramic views of the city, canals, squares and the capital city’s main attractions, the red light district and the old harbor. Guided bus tours operate daily and can be enjoyed in 15 different languages including English, Dutch, Spanish, Portuguese, French, German, Italian, Greek, Swedish, Hebrew, Arabic, Turkish, Chinese Mandarin, Japanese, and Russian. The bus will cover the city center and major highlights like Museum Square, the Royal Palace, as well as various churches and monuments. Daily bus tours start at very reasonable prices around $25 per person. If you’re feeling athletic, you can sign up for a 4-hour Amsterdam Bicycle Tour that will typically begin with a tour of the city and then continue on with a tour of the most beautiful windmill areas of the city's East Side and old city center. Some bike tours will even stop at breweries along the way for those feeling a bit thirsty. Most popular bike daily bike tours start at around $30 and also provide your bicycle of course. Sip wine and sample cheeses as you view the city at night during a two-hour evening cruise in the comfort of a glass-covered canal boat. In addition to the food, cruising the canals at night is a great way to learn about the city’s historic downtown. At night the city’s bridges are illuminated as well as many of the beautiful canal side homes. Some evening cruises will disembark to include short walking tours as well. Prices are very reasonable at around $40 per person. A private tour by car or minivan with a professional guide will make your visit to Amsterdam more meaningful and enjoyable as you enjoy access to the major attractions close up and explore some of the city’s hidden areas that most tourists miss. A professional guide will teach travelers all about Amsterdam life, shopping and the best places to go to, as well as include a bit of the history behind the extraordinary places and people who made up the city's past. Most private tours require a minimum of two people and a maximum of 8. The prices start at around $400 per person. A five day mini cruise through the most beautiful areas in Amsterdam is a relaxing way to see the sights on board a comfortable ship. 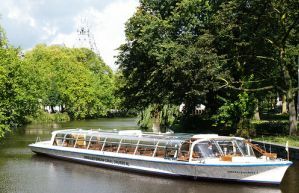 You will cruise the canals on a 50-yard long ship that accommodates 20 or 30 guests who will stay in private cabins with a shower and toilet. The boats are completely modernized and many feature TVs with satellite reception, air conditioning, restaurants, bars, lounges and covered wooden decks with deck chairs, tables and recliners. Multi-day cruises will vary in amenities and activities, but they are all very affordable when you consider that meals and lodging are included in package prices that start at around $500.